Designed in close collaboration with living legend Eddie Van Halen, the 5150 Overdrive puts Eddies full range of distortion right at your feet. This pedals full complement of controls will take you from the groundbreaking tone heard on early Van Halen records to the high gain, super-articulate sound he uses today. After setting the Output and Gain controls where you want them, use the 3-band EQ section to shape and customize your sound. For the bumped up gain and compression Eddie digs, just hit the Boost switch. Finally, use the Gate control to engage the 5150 Overdrives noise gate, active only while the pedal is turned on. 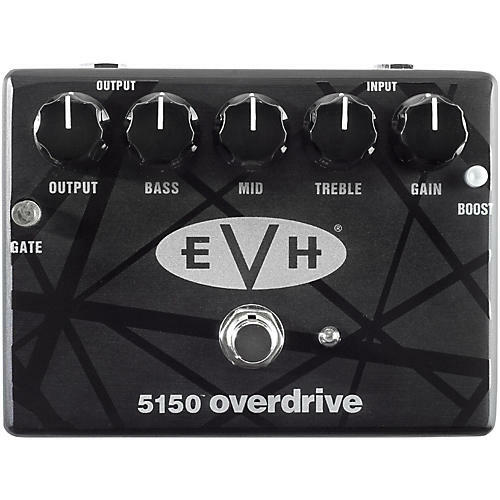 The 5150 Overdrive features true bypass switching comes in a road-worthy housing emblazoned with custom EVH artwork.